The number of U.S. farmers' markets has grown by 20% over the past three years to nearly 5,300 nationwide. This collection of tempting desserts inspired by those markets and the farmers who share their produce there satisfies the sustainable shopper's sweet tooth with more than 50 recipes for tarts, crisps, cupcakes, puddings, and more. Discoverclassics like Deep Dish Sour Cherry Pie and new interpretations like Tangerine-sicle Ice Cream. 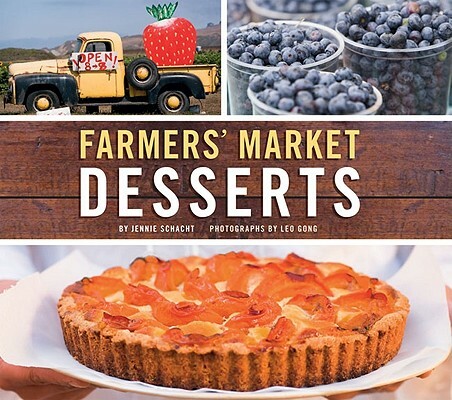 Featuring seasonality charts, "farmer journal" tips, and dazzling color photography to teach and inspire, Farmers' Market Desserts is the perfect gift for bakers, lovers of local produce, and all who share in the delights of the farmers' market. Jennie Schacht coauthored The Wine Lover's Dessert Cookbook. She lives in Oakland, California. Leo Gong is a San Francisco-based photographer.